This one's for the "They can't possibly believe what they're writing" file. Thursday morning, Ben White and Nancy Cook at Politico actually claimed that President Donald Trump is building "his 2018 political message by rebranding" predecessor Barack Obama's "economic legacy." Rasmussen Reports was the closest predictor of the final 2016 presidential results for the two major-party candidates. ... hard economic data on growth, job creation and wages look very similar to the last several years under Obama. The pace of job growth actually slowed slightly to 174,000 per month in 2017 through November, compared with 187,000 per month in Obama’s final year. 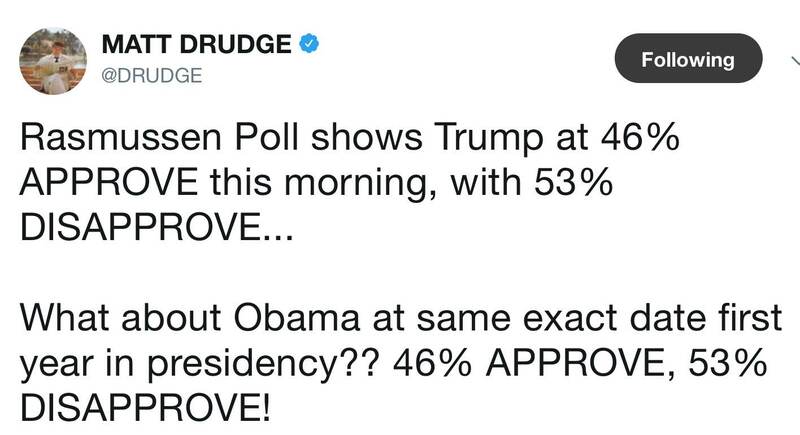 Even Trump’s stock market performance is similar to or trails Obama’s. So Trump supposedly inherited reasonably strong or tolerable growth, job creation, wages, and stock market performance. That's all so wrong it's very hard for me to keep from laughing. Let's also be clear, because the Politico pair aggressively tried to muddy the waters with meaningless comparisons to Obama's first year: What matters is what kind of momentum and accumulated damage Obama bequeathed to his successor. It's clear that Trump got an unprecedented amount of the latter, principally a mountainous national debt, massive over-regulation, and the monstrosity known as Obamacare, and very little of the former, which will be discussed in the rest of this post. We also should not forget that several economists were trying to manage expectations for Democratic presidential candidate Hillary Clinton's continuation of Obama's high-regulation, slow-growth economy by claiming that the best level of growth the U.S. economy could achieve would be 2 percent from here on out. Now let's look at job creation. The Politico pair overlooked two important things. The clear shift towards full-time employment is an indication of greater business confidence in the Trump administration after it inherited a business environment sorely lacking it. The second is that the government may be understating this year's level of job creation. That's because ADP's private-sector jobs estimate shows 2.296 million jobs added during the first 11 months of the year, which is 422,000 more than the 1.874 million reported by the government's Bureau of Labor Statistics. If ADP is right — and it may very well be, because its methodology appears to give it a better chance of detecting job creation at startup and emerging companies on a timely basis than BLS — the difference of roughly 38,000 jobs per month would bring Trump's monthly average per the Establishment Survey of employer payrolls to 212,000, well above the 2016 average of 187,000. To be clear, this year's performance in this area hasn't been satisfactory, but it's an improvement, especially compared to the 2.3 percent compound growth in weekly earnings seen during the last six years of the Obama administration. 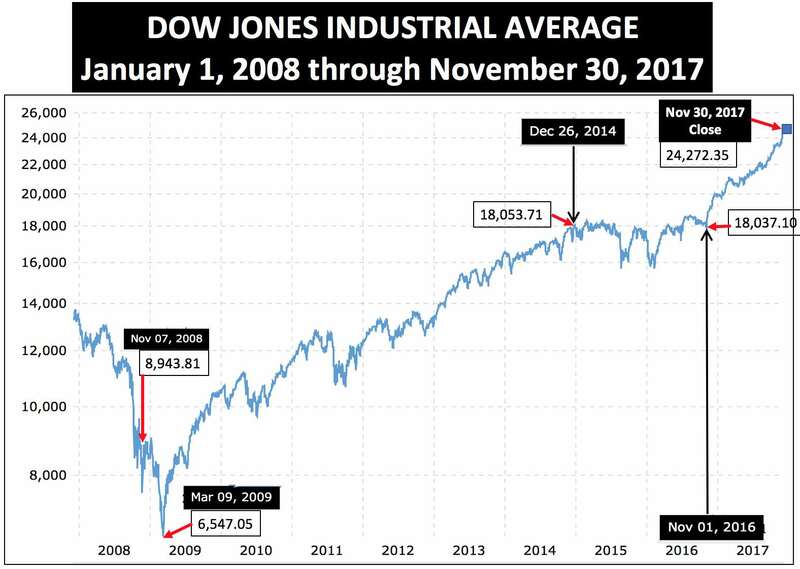 From November 30 through Thursday's close, the Dow has advanced by an additional 565 points to 24,837.51. As seen above, the Dow went nowhere for nearly two years before the 2016 presidential election. Part of the reason was the economy's dismal GDP growth during that time, but there's far more to it than that, and it involves the Federal Reserve. Remember quantitative easing? Oh yeah, that occurred when the Fed created a grand total of over $4 trillion out of thin air. This pushed money into the stock market, artificially propped up the zombie Obama economy, and financed its record federal budget deficits for six years. Guess when quantitative easing officially ended? In late October, 2014. Two months later, the stock market went into the nearly two-year flatline shown above, as investors figured out that the over-regulated, Obamacare-throttled economy was underperforming and would continue to underperform without the Fed's artificial and unsustainable help. Even after that, the Fed continued to keep interest rates at or near zero for the rest of Obama's term, enacting only one quarter-point rate hike in December 2015 before Election Day 2016 — and the economy still underperformed. Thus, it's obvious that Donald Trump inherited no meaningful "legacy" of economic momentum from Barack Obama. Though Politico reporters White and Cook, and others in the establishment press, will no doubt continue brazenly pretending otherwise, no one should be fooled.